Harmonica Bill (harp, vocals) has been a blues fanatic for almost thirty years and has been blowing harp for twenty-five. He's been fortunate to sit in with blues legends Son Seals and the Allman Brothers Band and to play a few tunes with the house band at Chicago's famous Checkerboard Lounge. Harmonica Bill & Marked Deck arose out of Bill's disappointment with the state of Long Island's blues scene (there are some great bands on Long Island, but none that played 1950's-era Chess Records-style blues until HB&MD) and "blues-rock" masquerading as real blues. Bill's influences range from the country blues of Sonny Terry, to Little Walter and James Cotton's Chicago blues sound, to the West Coast masters like George Harmonica Smith, William Clarke, and Rod Piazza. Ken plays guitar like the British Invasion (mostly) never happened. He plays sweet and mean through low-wattage amplifiers, and prefers fat-necked guitars with big strings because they are a better match for the resonant frequency of his big ol' head. He would prefer that people remain groovy, but don't take no mess. Ask him about his anchor jacket and dogs. Don't ask him about "how a 'real' bluesman oughta dress" unless you have a lot of time. Listen to Son House. Ken and Bill formed their first band, Chicken Foot Express, back in 1995, and Ken's Americana-roots band Sixteen Tons represented Long Island in Memphis's International Blues Challenge. Rich Albertson loves the blues, and it shows. His supreme taste and tone on bass have earned Rich spots with some of the area's best blues bands, including Chris James & The Smokin' Kings and the late 'Boom Boom' Johnson. Doug is the newest member of Harmonica Bill & Marked Deck, and we are so glad to have him! 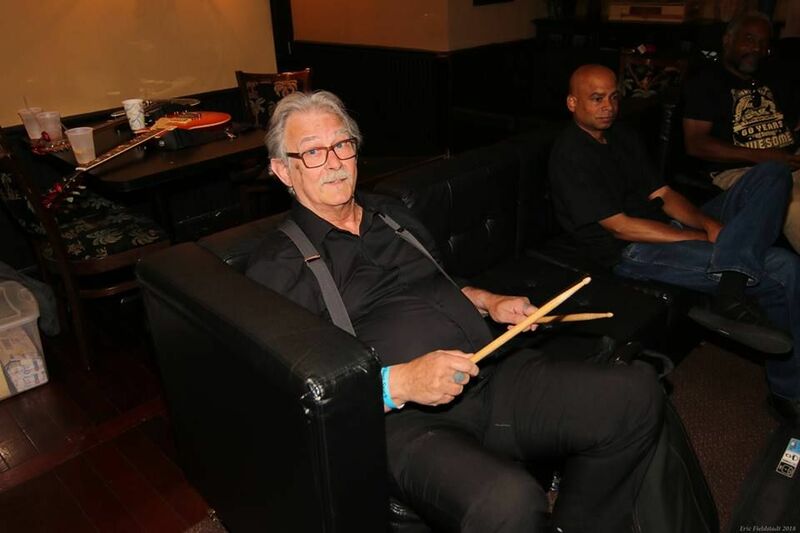 We love his jazz-influenced blues drumming -- so many of the great blues drummers come from a jazz background, like Fred Below -- and Doug is doing a great job keeping the beat for HB&MD. Doug has toured with several bands through the years and he brings a lot of experience and professionalism to Marked Deck. Now we just have to get some really good photos of Doug playing with us, so his bio doesn't have to have a picture of him sitting on a couch! Junior Davis brings huge tone to the mix and he is a true connaisseur of the West Coast blues form. While Junior loves to play rhythm guitar and support the band, his leads reflect his Kid Ramos and Alex Schultz influences. Junior has played with many Long Island band through the years, but he considers Harmonica Bill & Marked Deck his home. Harmonica Bill & Marked Deck is proud to represent Long Island and the Long Island Blues Society in the 2019 International Blues Challenge in Memphis, Tennessee!